Jack Ruby was born in 1911. His real name being Jacob Rubenstein. His parents were Jewish immigrants from Poland, and he grew up in Chicago. As a boy, he ran errands for mobster Al Capone. In 1937-39, Jack Ruby was a "union organizer" and "secretary" for a local branch of the Scrap Iron and Junk Handlers Union in Chicago. During World War II, Jack Ruby served in the U.S. Air Force. After a business venture with his brothers fell through, he left Chicago and moved to Dallas, where he opened up his first nightclub that he named the Silver Spur. In 1957-58, he was running guns to the followers of Fidel Castro, who were fighting to overthrow Batista. In 1959, Jack Ruby went to Havana to try to gain the release of Santos Trafficante, who had been jailed by Castro's government for his role in Mafia gambling and narcotics activities. Trafficante later participated in a CIA plot to kill Castro. During the early 1960s, Jack Ruby helped supply arms to the anti-Castro Cubans. At this time, he was an associate of Gen. Edwin Walker (Warren C., Vol. 25: CE 2389). During the 1950s-1963, he ran several nightclubs. At the time of President Kennedy's assassination, he lived in the Oak Cliff section of Dallas. 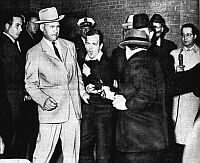 On Nov. 24, 1963, Jack Ruby fatally shot Lee Harvey Oswald once in the abdomen, in the basement of Dallas police headquarters, where he was being transferred to the County Jail. The incident occurred on live television. Ruby had walked down a car ramp to get to the basement, even though the narrow entrance to the car ramp was guarded by a police officer. Oswald died at Parkland Hospital, as doctors tried to save him. In 1964, Jack Ruby was brought to trial for the murder of Lee Harvey Oswald. In that same year, he was convicted and sentenced to death. In 1966, the judgment of death was reversed by the Texas Court of Criminal Appeals, and he was granted a second trial. On January 3, 1967, Jack Ruby died from the effects of galloping lung cancer before his second trial could begin. He claimed that he had been injected with cancer. While in prison, he was visited by several doctors. His picture is found below.